Save the Date: July 11, 2015, 6:00 p.m. This is the first in a series of performances focusing on the compositions of Ludwig van Beethoven and Frederic Chopin. 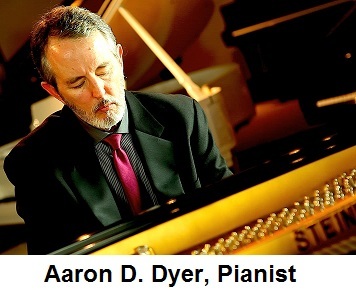 Mr. Dyer will provide a brief comment on how these works form the foundation of a pianist’s artistry and technique. Join him at Collora Piano on Saturday, July 11, at 6:00 p.m. Collora Piano is located at 1451 Wycliff Avenue, Dallas, Texas 75207. Admission is free. Why do you call the series "Fundamentals?" I don't want to confuse what is fundamental with what is rudimentary. There is nothing rudimentary about the Beethoven sonatas. What I mean is that, for me, Beethoven and Chopin are vital to the foundation of a complete pianist. Beethoven's career began right around the time the piano became a mainstream performance instrument. You can, I think, compare it to today's so-called "millennial" for whom the Internet has always been a normal and pervasive part of daily life. I majored in music in college. The thought of majoring in computer science was unthinkable because it was like majoring in electronic engineering...only the geekiest geeks would consider it -- like the guys who put men on the moon. Programming -- the thing I now do for a living -- was as far from me then as was being an astronaut. Even the term "information technology" did not exist until after I was born, and awareness of it did not grow until the 1970s. Now, anyone can be a programmer and everyone has a smartphone. For today's child, a life and a career in computer technology is not only available but is probably at or near the top of the list for many. By comparison, what we call the Industrial Revolution began in the mid-18th Century. It transformed life for the western world. At first, the piano was a novel technology. Think the "brick phone." Some people had heard of it or tried it. Gradually it was used for performance, even while it wasn't available or popular enough to be used everywhere. But by the time Beethoven's career was in full swing, the piano was prevalent enough that he composed specifically for the technology that makes the piano what it is -- striking strings with hammers to create a wide range of notes and dynamics. It was always part of his life. For us today, it would be like shrinking the brick phone so it fits into your pocket. In addition, the piano -- and in particular the piano sonata -- was Beethoven's musical laboratory. Early pianos had only five and a half octaves, far fewer notes than today's 7-plus octave giants. The range of notes used in Beethoven's early sonatas may seem to us limited, but he used everything the piano of that day had to give. His later sonatas exhibit a greater range of notes because later pianos possessed a greater range for him to use. Beethoven pushed the technology and the performance demands as far as he could. Not only did Beethoven work during an auspicious time for the instrument, the growth of the philosophical and emotional content of his work grew with the ability of the piano to deliver it faithfully. Today's piano technology uses the same basic mechanism, but the acoustic properties have been refined to such a degree that today's pianist can plumb Beethoven's work to a depth of texture and color that might make the composer jealous! All of this contributes to understanding why Beethoven's sonatas are fundamental to the pianist. You converse with a master who said things with the piano that could not be said any other way, and which could not be said at the time by most other piano composers. Coming up: Why Chopin is fundamental. What if tokafi.com had asked Aaron their 15 questions? I'm doing very well. I live in Dallas where I have been for most of my life. My family moved here from El Paso in 1968 and except for a year at Cincinnati Conservatory I have lived here ever since. What's on your schedule right now? I began a project a couple of years ago to record all of the Beethoven sonatas and Chopin nocturnes. Having a full-time job forced me to juggle priorities, so there are stretches of time when it seems like nothing gets done. But I have an upcoming performance in July -- July 11to be exact -- that will involve two sonatas and at least two nocturnes. If you hadn't chosen for music, what do you think you would do right now? No idea, but my full-time job now is as a programmer, so possibly that. I love to write so I like to fancy I might have been a novelist, but that's not exactly a career job one can apply for. What or who was your biggest influence as an artist? There have been so many, including my wife, who is a wonderful artist with fashion and jewelry. She is also a wonderful cook and I see artistry in what she does. I never escape the influence of my college piano teacher, Dr. Harris Crohn. Who he was as a pianist, and our time together when I was in school are still a presence in my life. Learning to see art in small things is, itself, an artistic influence. What's the hardest part about being a musician and what's the best? The hardest part is seeing how some musicians have achieved escape velocity from some of the confining elements that limit artistic expression, and then learning to recognize those elements in my own experience and how to go beyond them. The best part is the hours of practice. The solitude, the vision, the feeling of knowing what can be achieved are so fulfilling. What's your view on the classical music scene at present? Is there a crisis? I think one has to take the long view. There will always be a large segment of the population with no understanding or appreciation of it. But it's called "classical" music for a reason: It is based on reason and timeless values, rather than merely the latest trend. And so I think there will also be a generation that sees the value it brings to society, philosophy, education, art, and performance. Some feel there is no need to record classical music any more, that it's all been done before. What do you tell them? It is true that there is a huge body of classical recording, much of which can be obtained for free. My recording project is based not on whether I am adding something new or unique to the body of recorded classical music, but, in a way, *because* of the huge body of proven expertise. Part of my life work is to demonstrate the ability and skills required to produce such a recording. But as for marketable recordings, each performance is unique. It has a signature, fingerprints, and sometimes the story behind the performer leads to understanding the performer through listening to the music. Certainly, for one recording to compete with another for its own sake brings marketing challenges, but the world always loves a story, and I'm convinced it can lead back to a recorded performance as part of the story. Add to that the continued advancement of recording techniques, and the ease with which both audio and video can be produced and distributed, the market may be more wide open than one might think. What constitutes a good live performance in your opinion? It might be tempting to require a feeling of newness or spontaneity from the performer. But I'm not sure that's on track. Compare it to watching a sprinter like Usain Bolt. If you never saw him run in person, you might be awed by the first experience of seeing it. But what if you later learned Bolt was not running all out? You did not see his fastest time, or even a serious attempt to set a record. It might be enough, though, that you saw a demonstration of years of perfecting his technique, plus the raw physical talent and a demonstration of flawless running skill. For many people, a classical music performance might not be in a list of a pianist's best performances. By definition, it cannot be. But for self-confessed neophytes, it might be a marvelous experience, and that, I believe, is perfectly legitimate, even if for the pianist it was only a workmanlike job. So what one has to require is evidence of a serious pursuit of perfection, a genuine understanding (and, I believe, love) of the composition, and a deep respect for the audience that is evidenced in integrity of the pianist's approach to the performance. What's your approach to performing on stage? To be the listener. I'm a pianist because I love the music, because it has a visceral and spiritual impact on my life, and especially in that moment. Someone who attends my performance has made a conscious decision to listen to me and see if there is something of value to gain from it. I want each audience member to share the experience of awe and beauty and motion and texture and color and all the things that make me want to sit and practice every day. What does the word 'interpretation' mean to you? It means to play the piece. One does not simply recite a piano piece. Every performance is an interpretation. The first priority, then, is to recognize that you are interpreting for the audience. A deliberate divergence from the written page on the grounds of disagreement or artistic license is not really interpretation, but more of a quarrel. There is a fascinating version of "Rhapsody in Blue" that I heard on the radio some ten years ago. It was a deconstruction by a jazz ensemble. I loved it! I've been looking for it ever since (unsuccessfully, so far). But I don't regard it as interpretation. For me, interpretation is what you can't help but reveal when you attempt to fulfill a composer's intention. True or false: It is the duty of an artist to put his personal emotions into the music he plays. As opposed to the duty to take them out? I'm not sure that makes sense. I guess I would refer to my statement about interpretation. If what is meant, however, is an emotional display during a performance, I do not see it as a duty. Personal growth involves self-knowledge. I think this includes an awareness of whether the thing you want to bring out in a performance is the thing you actually are achieving. The intent to do it is not enough. It's all about execution. My premise is that playing a piece is an attempt to realize, in a real-time performance, what the piece means to you inwardly. If you don't, I think the audience will probably let you know if you disappoint them. I find that question superficial. It's like asking what is my favorite color. Music is language. I have dedicated a life work to mastering it. True or false: People need to be educated about classical music, before they can really appreciate it. False. Greater knowledge brings greater appreciation. But my dad was always my biggest fan. He was only marginally knowledgeable about classical music but he had a definite opinion on whether what he was hearing was authentic and whether it was the performer's best effort. You are given the position of artistic director of a concert hall. What would be on your program for this season? A wide variety. First, I would recognize that the wider my audience, the more I have to respect popular taste. That means 19th-century music. Second, I would ensure that works by living composers are on at least two programs. Second, I would leverage technology by using video during performances. Think about it: fifteen minutes before the concert you see an exerpt of rehearsal, hear the composer talking to the ensemble. Then, during the performance, you see closeups on huge screens of performers, or perhaps you see examples of visual arts that parallel the time or even the work being performed. Make it a full experience. What's your favourite classical CD at the moment? I rarely pop a CD in the player. But one of my favorite CDs is a performance of the Ravel G-major piano concerto. I couldn't even tell you the performer, but it's a fine recording and one of my favorite pieces. I have a love affair with French music of the early 20th Century. Years ago I heard Ivan Moravec play that concerto live with the Dallas Symphony. I don't know if that recording is available, but I'd love to have it. Have you ever tried playing a different instrument? If yes, how good were you at it? I played cello until I was about 14. I wasn't great, but I was first chair in the high school orchestra. That probably says more about the state of the high school orchestra than about any skill I had. I taught myself to play the guitar and organ. Actually, I had a semester of organ instruction. But it wasn't until thirty years later that I seriously applied myself to learning to handle the pedals. But if it comes to a competition between time spent at the piano and time spent at the organ, I have too little free time as it is, also having a full time job. So piano practice time is the 800-pound gorilla and always wins. Beethoven dedicated his opus 2 piano sonatas to his teacher, Franz Joseph Haydn. This was a grown man, not some adolescent neophyte trying to imitate Haydn's works. This is not to say Haydn did not influence Beethoven. Of course, he did. But 20-something firebrand composers are busy making their own statements. And let's not mistake early music for easy music. Opus 2 has this in common with Haydn's work, -- technically easy passages offset by brilliant virtuosic passages not for the faint of heart. Some pianists may find these early sonatas more adaptable to an undeveloped technical prowess. But a more formidable technique is not too big for these pieces. In fact, it is music like this that is so difficult to perform, because even minor mistakes stand out to the untrained ear. On the other hand, minor bobbles mistakes in Beethoven's opus 106 (Hammerklavier) might to most listeners go wholly unnoticed. The stylistic difference between opus 2 and opus 106 seems, to me, galactic in scale. But neither is insignificant and I am not just humbled but somewhat humiliated at my attempt to do justice to these early strokes of genius. It's the first sonata in the book. How hard could it be? And, in fact, the opening pages are not technically challenging. Not, that is, in the sense of whether one can execute all the notes a tempo. All four movements can be performed in fifteen minutes. Any decent pianist can do it. But there is that matter of style. Beethoven's writing is a mixture of bumpy road and smooth, abrupt dynamic changes, along with the sarcasm of Haydn and the charm of Mozart. This is all good news, for there is so much meat to chew on and digest, so much to work with when making artistic decisions. But that's bad news, because there is a long trail of "right" and "wrong" decisions, performance practices of the day, and how I feel about it in a 21st-century context. The last movement of opus 2 number 1 reminds me of performing Grieg's lyric piece "At the cradle." Every performance of that is so incredibly slow that I cannot relate to it. When I performed it I worked to moderate my tempo downward somewhat, but it still had to sashay a little where other performances seemed to plod. (Perhaps "sashay" is the wrong word, here.) So, with this last movement of Beethoven, other performances seem to forget that Beethoven was, y'know, 26 years old. Not refined. Not restrained. Not even reasonable. The last movement is where Beethoven cuts loose. When he says prestissimo I think he's pretty damned serious about it. And that's how I play it. All of the opus 2 sonatas have interesting questions of pedaling on a modern piano. The second of these, in A-major, is one of those that can be successfully done without using the pedal at all. I don't know that this was Beethoven's intention, or even necessary. But stylistically, it can work because of so much staccato work in the piece. I practice with and without pedal, in part because I can't make up my mind whether to have or to have not. It's not a matter of right or wrong, but simply that it's fun to play the piece without using the damper pedal. Playing without the pedal is particularly gratifying in the second movement. There is very little need for the damper pedal. In some of the trills, maybe. But you can eat these french fries without any ketchup at all, if you get my meaning. The classical style did not demand constant pedaling. The harmonic structure of 18th-century music complied with the concept of articulated phrasing. Things were defined and precise. But there was some demand to extend the range of how many notes could or should be sustained throughout a passage. It was as pleasing then to hear full, rich chords sustained in the ear, just as it was for Palestrina, Chopin, or Prokofiev. So, pedal is a special effects device for Beethoven. It is used for color, even for mixing in some dissonance now and then. When I have to be a "responsible" pianist, it's time to use some pedal. But I try to put my foot flat on the floor until it's time to use the pedal. The fun of pedaling early Beethoven is in deciding what to mix and how much and for how long. My own feeling is that right around the frequency of the human voice (roughly 100-500 hertz) is where mixing sounds is most understandable, precisely because it is the frequency of the voice. This is how we hear things most easily. This is roughly two octaves, one on either side of "middle C." Pedaling as a scale or arpeggio passes through that range adds nice color to it. It's sort of the fulcrum of the harmonic balance, and as the fulcrum moves in either direction, the sound sometimes seems more unbalanced to me. But we're talking here about the sensibility of Mozart and Haydn. Later Beethoven was written for a more advanced instrument, with a wider range of notes on the keyboard, and a bigger dynamic range. Yet, even when we get to the third of the opus 2 sonatas, we'll glimpse the tip of the iceberg of Beethoven's demand for more aggressive pedaling. Hearing the last movement performed was what first attracted me to this piece. It's a clinic in how to construct a graceful movement out of long arpeggios. It's also a clinic in how much contrast you can create with a middle section of angry, staccato, chromatic scales. It's almost off-putting to me to hear the middle section attempt to destroy all that came before it. Then the first theme returns, and elegance and reasonableness are restored...only to revisit the anger briefly, just before the piece concludes. I guess it's to be expected, but at least peace wins out in the end. So there's that.